Register Log In ECN Forum Forums Photos for General Discussion Rainproof Cover? troubleshooting a tripping breaker, I found this on the deck of a beachfront house.... Yeah, we've had some seriously heavy rain! 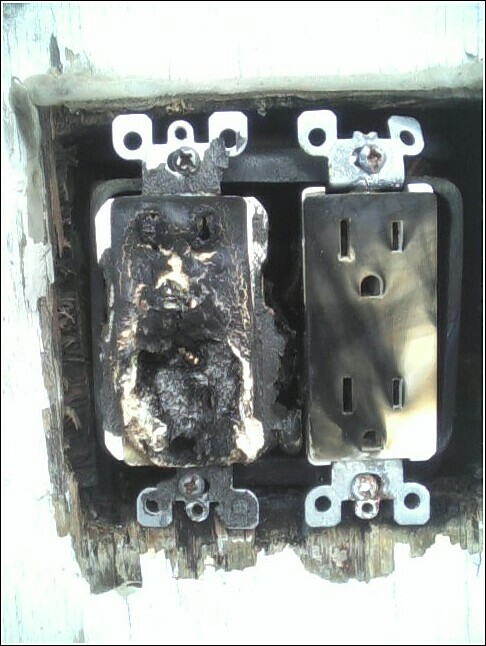 From the looks of that second pic, luckily that surrounding wood was wet from all the rain or this could've been a post-house fire repair call! Was either cover open when it got soaked, or was the water up that high? Edited for my dyslexic spelling..
Man, there's been some serious cooking going on in there. Looks more like bad sealing technique than anything else. And it's impossable to tell if the thing on the left was a GFI? From the face... you can see it was by the pic with the cover off. Why do we assume this had anything to do with rain? There are a few other things that could have caused this. There are a few other things that could have caused this. Such as? The failure looks too violent to have been from a simple overload.... just my 2 cents..
Randy: How much damage to the wiring inside the box? I am not saying water wasn't the culprit just that I don't automatically assume it to be because it is outdoors. A loose connection on a heavily loaded circuit coils certainly have done it. 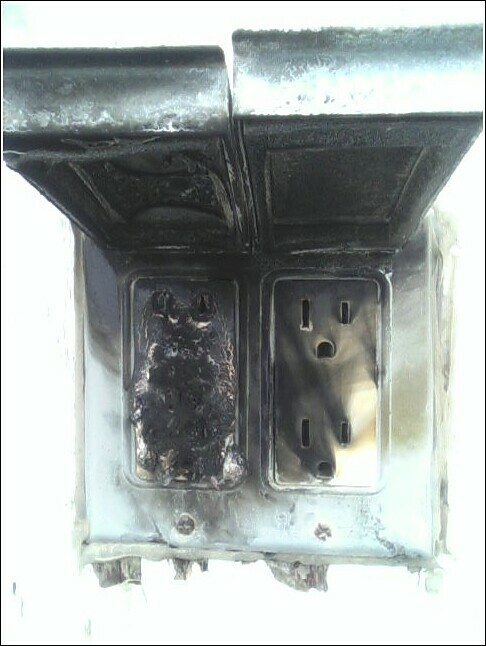 The receptacle on the left is a Leviton GFCI.